If you think going green in your home or business is expensive, try not going green. If you’re not familiar with the renewable energy movement, you soon will be. It’s quickly becoming the wave of the future. Businesses not only are becoming more climate conscious but know their customers are as well. You can reduce energy costs in your residence or organization by voluntarily purchasing green power for your electricity. Installing wind turbines and purchasing green power via renewable generators are creative alternatives homeowners and businesses are looking toward to create electricity and minimize dependence on fossil fuels. 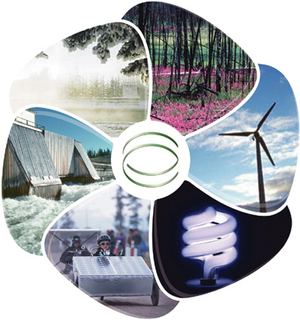 The National Renewable Energy Laboratory is seeing growth in the voluntary green market. Large institutions from universities and hospitals to corporations and residences are jumping on board and voluntarily purchasing what are known as renewable energy certificates. When you or your organization buy a renewable energy certificate from Renewable Choice Energy, you’ll actually receive a certificate which states you’re using green energy. At the risk of oversimplifying–you are buying a portion of energy on the power grid that uses renewable generators rather than fossil fuels. Although fossil fuel costs less than renewable power presently, if all businesses and residents purchased even 2% renewable energy and stayed with 98% nonrenewable, the environmental burden of electricity powered by fossil fuels would decrease immensely. Nationally, only 25 % of utility companies offers the voluntary green power option (if you lived in a state that did not have the option, you can purchase a generator from another state). That said, it will take time for people to buy in and significantly change our present energy culture. Right now, monthly power bills for green power cost more than conventional electricity. For example, an average business customer in Illinois who uses 7.5 megawatt-hours per month pays an average monthly power bill of about $642, said the U. S. Energy Information Administration in 2007. However, if you look at the bigger picture and imagine that everyone offset their electricity with a portion of green power, the benefits would outweigh the costs, and we’d see a return on our investment in reduced health and safety costs and less impact on our environment. Going green with renewable energy is simply good for your business bottom line. Chicago businesses are becoming green and purchasing renewable energy certificates to claim their renewable portion of energy on the power grid. Chicago’s Digital Hub, LLC is the case in point when it comes to a cost-benefit analysis of going green. The printing industry has always certain health hazards for shop workers, particularly in terms of inks used. Well, employees’ health comes first at Digital Hub, where 3 years ago, safer vegetable dye printing inks have replaced the printing chemicals used in the past. The savings? Greater employee productivity, better employee morale, and less use of sick days. The installation of a rooftop turbine to generate electricity is also in the works for Digital Hub. Also notably green is Chicago’s Talbott Hotel, which buys 100% renewable certificates for its electrical usage, a move which merited them the Green Seal Certification. Green-conscious customers are taking notice of the Talbott Hotel’s efforts. Another energy-saving feature you can find in Talbott Hotel rooms is the green button option on your room’s thermostat. Push the button while you go out for the day, and you’ll be very green by decreasing energy usage in the room. General Manager Troy Strand says about 70% of hotel guests are using the button, a pleasant surprise for the hotel. The Talbott Hotel rewards participating customers with a free 30-day carbon offset credit gift card when they check out. Talk about a win-win for the Talbott and its customers. The bottom line: Green can get and keep you in the black.